I know everyone is trying to design on a dime these days, but when you are living on one income, you really have to make a penny (or ugly lamp) stretch. 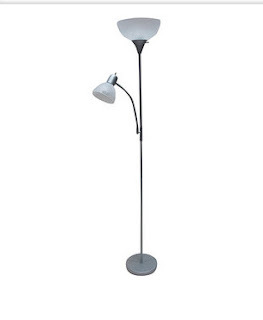 I kind of hate these combo floor lamps from Wal-Mart. They look like they belong in my college dorm. However, we have only 3 windows in this house, no overhead lighting, and no money to buy new lamps, so I have to make them work. First I tried to pop off the plastic globe on top of the lamp and put on one of my favorite white drum shade. I didn't take a picture of it because it was just too ugly. Then I remembered this post where Sherry used sharpie on a cup, and I thought, "Hey, why not?" I whipped up a stencil using an index card, based on my all time favorite stencil used in the JDC Office (Emily is a creative genius). I had to adapt the pattern a bit to fit the cylindrical shape of my plastic lamp. Much to my delight, it worked! Bonus - I already had a teal sharpie! I am in love. Or at least, as Ron Swanson would say, "She'll do. She'll do just fine."